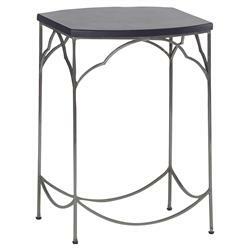 Sleek and whimsical, this one-of-a-kind side table brings character to any room - from den to foyer. The slender, nickel frame has lovely curved accents that lend an open, airy feel. A slick ebony tabletop caps off the design with an added dose of elegance. Standing alone or clustered together with other tables, this piece makes the perfect addition to homes of any style from industrial to modern classic.